It’s time once again for me to look at another superhero themed podcast and give you the details along with my personal perspective on it. I’ve been an occasional listener of this podcast for a long while now, and they’re another podcast that has a large back catalogue. After this, I have just one more podcast that I’ve previously listened to before moving on to submissions and random searches. If you host or are just a fan of a current podcast whose main focus is superheroes or comic book movies let me know and I’ll cover it in a future edition of Superhero Podcast Review. You can reach me in the comments section, on Twitter where I’m @Bubbawheat or e-mail me at Bubbawheat@msn.com. Now that that’s out of the way, onto today’s review. 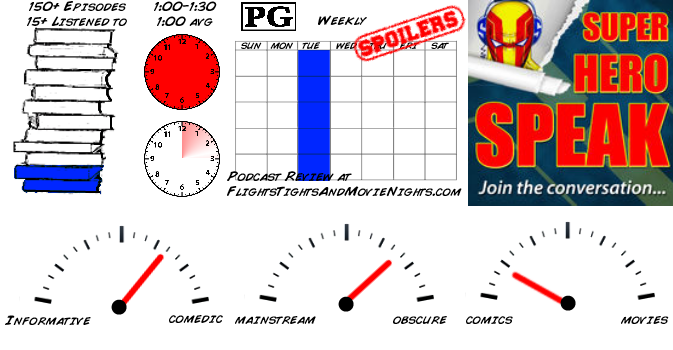 Production format: A single discussion with a group of comic book fans that covers a range of comic book, movie, and TV news topics as well as some discussions on specific movies or shows. Also, they often have interviews with comic book creators, writers, illustrators, and some actors/directors. The three hosts: Dave, Ben, and John have a superhero themed discussion each week unless they’re busy having an interview with anyone from indie comic book creators to actors or directors. Most of the talk on non-interview episodes tend to be centered on general news of the week, but there is very much a friendly banter that comes across as three guys who are good friends and have known each other for a long time. There is plenty of humorous speculation about what might happen across comics, movies, and TV as well as occasionally more serious discussions along those topics as well. Their interviews are varied and often have hosts missing due to schedule conflicts, but are always fun and while I didn’t listen to any recently, while there is some promotional discussion on the product they’re working on currently, there is also quite a bit of more random discussion so you get to hear the more normal side of their guest rather than just their PR side. These guys do have an in with a small comic book publishing company so they tend to have a large number of comics industry guests, often more indie guys. But they have also talked to a few actors and directors, like an early get for them was Doug Jones. They’ve also talked to the director of indie film Real Heroes. Their non-interview episodes run the gamut where they’ll talk about everything from movies to comics to television, even the occasional Hollywood gossip when it involves those known for superhero properties. But through it all, there’s a definite thread of guys who are fans of comic books in general, and even when they’re talking about movies and TV, there’s going to be a thread of comics entering into the discussions. As I have said many times, I’m not that big of a comics guy. As such, I’ve only listened to one or maybe two episodes where they interviewed someone within the comics industry. And as I will often re-state during the verdict section of these reviews, this verdict is about my personal taste in podcasts, other tastes may vary. For their regular episodes, they do cover enough movie and TV news to keep me interested and I typically find their back and forth banter quite funny. They also have some interesting speculation, like on their most recent episode, they liken the comics trend that’s been expanding the Spider-Man universe on the heroes side as being the potential for something similar to the Green Lantern Corps. I often tend to skip over this one in my subscription list, but every time I do listen I rather enjoy it. Posted on July 9, 2016, in Superhero Podcast Review and tagged comic book, film, movies, podcast review, Superhero. Bookmark the permalink. Leave a comment.